Connie Chabot didn't know where to turn when her daughter began struggling with her gender identity. Now, she's a chair of the board of Gender Creative Kids, a group that provides resources to parents and children alike. Close up on Gender is a CBC Montreal series for radio, web and television. You'll hear from Montrealers who are sharing their stories, or thinking and acting differently when it comes to gender in 2019. What are you supposed to do when your child realizes they are transgender? When it happened to Connie Chabot, she didn't know where to turn. Chabot thought of herself as someone who was aware of LGBTQ+ issues — in the past, her child had expressed to Connie that they might be gay, and Chabot had accepted it wholeheartedly. But when her daughter, who was assigned male at birth, began struggling with her gender identity, Chabot didn't know what to do. "My child was depressed, my child was anxious, my child from the age of 10 years old was talking about suicide, my child attempted suicide in Secondary I," Chabot told CBC's Daybreak. "I had access to a lot of resources. I had access to psychologists and psychiatrists and all kinds of people. But it didn't quite help us," said Chabot. Years later, Chabot not only knows where to go — she chairs the organization dedicated to helping other families like hers. 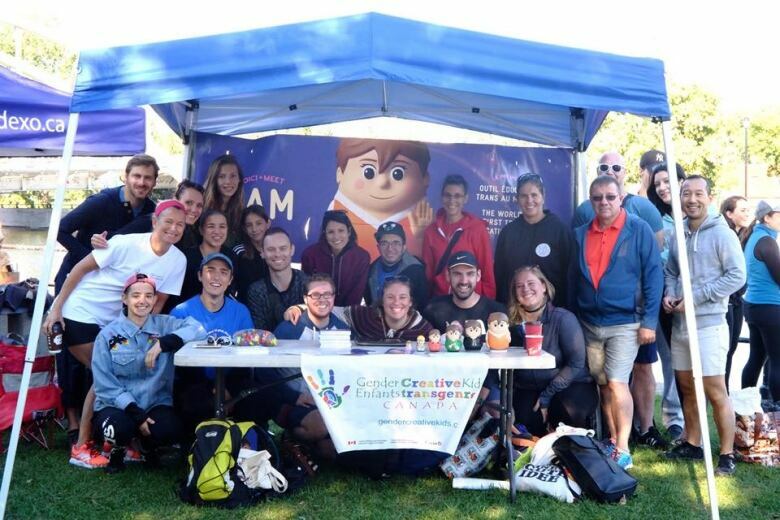 Gender Creative Kids is a Montreal-based organization that helps support families of transgender and non-binary youth through peer support, both for the parents and the children involved. Chabot's family got involved with the group after her daughter met another child who was participating in the program. Once Chabot's daughter began using Gender Creative Kids' resources, she came to the realization that she is transgender. "The moment she said it, it was like she was a changed person. It was like a train moving forward that I wasn't going to stop," Chabot said. "We were going to go with it because all of a sudden, I had my child back." Gender Creative Kids has created Sam, the doll, as part of their You Inside project. The doll tells the story of a child on a journey to discover their gender identity. Chabot's journey is one that Antoine Beaudoin Gentes, the project manager at Gender Creative Kids, sees often. "The families, before they find us, they feel so alone." "And then they find us, and they see happy kids and happy families. They just realize, 'Oh my God, we're not alone, we can get help,'" said Gentes. When families arrive at peer support groups, the children hang out together in one room, while the parents stay in the other. Children and teens may do activities like art therapy, while parents share their experiences. It's a lifeline for parents like Chabot. "That's when they can close the door and they can shed some tears," she said. "They can say: 'What do I do? You know, how come I never saw this coming?" Beyond offering support, Gender Creative Kids helps put families in touch with the resources that they need. Beaudoin Gentes said that not every doctor knows where to refer transgender or non-binary children, and outside of city hubs like Montreal, those resources can be scarce. The group also offers workshops in schools and daycares to help educators learn more about transitioning youth. Gender Creative Kids is also currently before the courts, pushing for changes to the Quebec Civil Code that will make it easier to legally transition. Beaudoin Gentes said the current system is complex, long, and hard for families to navigate. "If you go through this process and you are just facing difficulties and obstacles, we think it's bad for the kids.… So we need to help them, the easiest way possible." How can we make Montreal nightlife safer?